The conventional surgical treatment for thoracolumbar burst fractures is physically invasive for the patient and also causes problems such as the sacrifice of healthy mobile segments to stabilize the fracture site. We performed a procedure for the treatment of fresh thoracolumbar burst fractures by combining percutaneous short pedicle screw fixation and vertebroplasty with transpedicular intracorporeal hydroxyapatite blocks grafting. 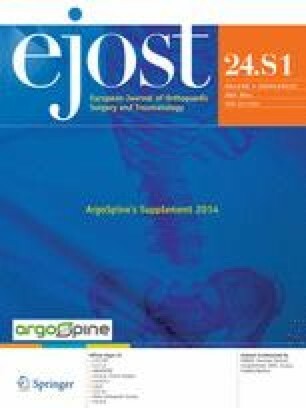 Patients with type A3 fresh thoracolumbar burst fractures with no or mild neurological symptoms were treated using temporary posterior fixation without fusion. Consecutive 21 patients were studied, with a mean age of 45.4 years (range 23–73) and a mean follow-up period of 21.9 months (range 15–25). We evaluated operative time, estimated blood loss, low back pain on a visual analogue scale, change in the kyphotic angle, correction loss, bone union, and complications. The average operative time was 95.7 min (range 69–143), and the average blood loss was 38.6 mL (range 10–130). The average correction angle was 9.6°. There were slight correction losses of height of the vertebral bodies. Bone union was obtained in all patients, with no instrumentation failures. Our procedure resulted in no surgery-related complications. For the treatment of type A3 fresh thoracolumbar burst fractures, this method is less invasive and can preserve the adjacent healthy mobile segment. Our treatment is an optional therapeutic strategy for patients with thoracolumbar burst fractures and is a good option particularly for young adult patients.